1. Season the chicken thighs. Heat the oil in a non-stick frying pan, add the chicken and fry on all sides to brown all over. Transfer to a flameproof casserole. 2. Pour off some of the oil from the pan, leaving 1 tbsp behind. Reheat the pan, then add the shallots, carrots and artichokes and brown over a medium heat. Stir in the sugar and soy sauce, then transfer to the casserole, pouring over the chicken. Add the thyme, beer and seasoning, then bring to the boil. 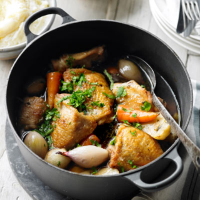 Half cover the casserole and leave to simmer gently for 40–45 minutes, until the chicken is cooked through, with no pink meat, and the juices run clear. 3. Scatter with chopped, flat-leaf parsley and serve – with mashed potato and steamed, shredded spring greens. As an alternative serving suggestion, remove the chicken from the pan and pur? the vegetable mixture to make a thick sauce. Stir in 2 tbsp double cream then return the chicken to the pan and heat through gently. Scatter with chopped parsley and serve. Carry on with the Fuller’s Discovery Blonde Beer.